﻿ Abbazia De Luxe Venice. JIMAT di Agoda.com! Abbazia De Luxe menawarkan bilik-bilik mewah di pusat kotaraya Venice. Ia adalah berhampiran dengan stesen keretapi utama Santa Lucia dan kawasan parkir utama di Piazzale Roma. Saint Mark's Square dan Rialto Bridge adalah dalam 20 minit berjalan kaki dari Abbazia, sebuah biara lama yang telah diubahsuaikan bergaya tinggi. Vaporettos, pengangkutan air awam tipikal di Venice, berhenti berhampiran. Bilik-bilik di Abbazia Bed and Breakfast mempunyai penghawa dingin, TV skrin plasma, saluran-saluran satelit dan internet kabel berkelajuan tinggi. Beberapa darinya mempunyai pemandangan indah ke Grand Canal. Para kakitangan boleh menempah tiket-tiket muzium, menawarkan maklumat tentang kotaraya dan membuat tempahan pelancongan. Sila maklumkan Abbazia De Luxe mengenai anggaran waktu ketibaan anda terlebih dahulu. Anda boleh menggunakan peti Permintaan Khas semasa membuat tempahan atau menghantar e-mel ke tempat ini. Maklumat hubungan boleh didapati pada pengesahan tempahan anda. Selepas jam 17:00, daftar-masuk berlaku di Hotel Abbazia yang bersebelahan. Parti 'bachelorette', parti orang bujang atau yang serupa tidak dibenarkan di penginapan ini. Abbazia De Luxe must have been a hidden find in Venice. If you have done your research on Venice you would want an accommodation that is easily accessible, especially if you are bringing luggages with you. Abbazia De Luxe was right beside the train station and in front of the vaporetti station which makes it really accessible. While it is hidden away in an alley with a deceptively small door that leaves questions about its interior, once you get in you find yourself in another world entirely. While small, the place including the room was nicely decorated and gives comfort to the guests. It certainly is not easy to find a place like this. 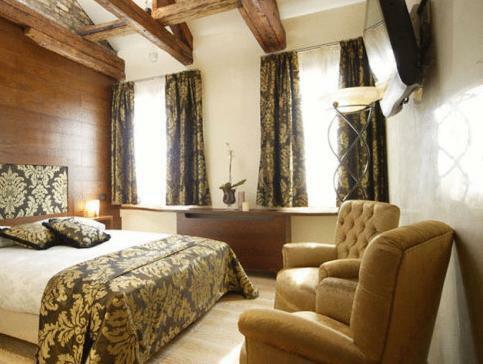 The rooms are reasonably priced as well in comparison to other hotels in Venice. Would definitely recommend this to anyone in Venice. 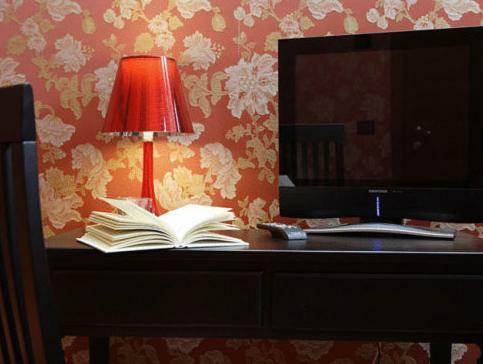 When we arrived at Hotel Abbazia, we were told that our room at Abbazia de Luxe was leaking and not possible to be used. So were moved to Hotel Abbazia. I was concerned as previous reviews of Hotel Abbazia was underwhelming. However, I was pleasantly surprised by the courteous and very pleasant staff, from the receptionist to the man who brought our luggages to our room. We were given a decent room with view of the garden and a huge bathroom. My only gripe is the air conditioning was not cold at all. We tried to sleep with the window open (since the weather outside was pleasantly cool) but couldn't because of the mosquitoes (Venice does have plenty of mosquitoes). So we endured the rather warm air conditioned room. Honestly, if the air conditioning was functioning properly, Hotel Abbazia would easily deserve its 3 star status. Theres no lift so u have to lift ur luggages. Staff were friendlu. About 3 minutes from the train station and the ferry boats. Rooms are a bit dark. Position , size of room and cleanliness. Fantastic experience . If there are any negetives that would be a limited selection for breakfast. 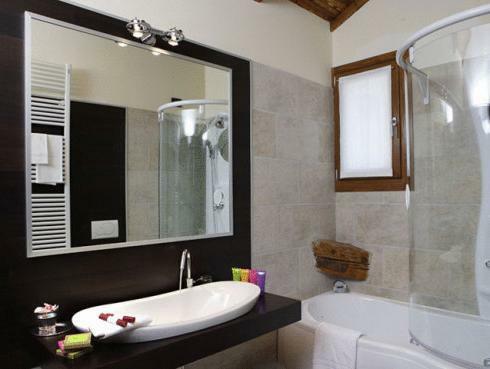 The location within a few minutes walk from the train station, the Grand Canal and the vaporetta to the bus station. The incuded breakfast. The firm but very comfortable bed. We enjoyed our stay and found the woman at the reception very helpful. The hotel is not to be confused with the Abbazia hotel just down the street which has a garden area and is apparently owned by the same proprietor. The rooms in the Abbazia De Luxe Hotel are on the second floor which requires going up a long flight of stairs. The room was small but adequate and the bed comfortable. We stayed for 2 nights and did not have any hot water but we only mentioned it the morning we were leaving and they promptly started to try to fix the problem. We really enjoyed the stay. The room were spacious, comfortable and the staff is really friendly and they speak good English (something that is rare in Italy). Overall we really enjoyed the stay and will definitely book there again next time. It was really nice in our last stay. It was a one night stay and it just spent us 1 min to walk to the hotel after we came out from the train station. There were two buildings, one is new and the other one is older. We stayed at the one at the head of the avenue. We were staying a suite room and it gave us a great view. We booked the superior room with the grand canal view for a night in Venice and never regretted it at all. The hotel is very near the train station (about 3 mins walk) as well as the water taxis and gondolas. The room is fairly big, nicely designed due to its boutique theme, very clean, a big bathroom and excellent views of the grand canal which was just about 15m away from the window. There was even an in-built Jacuzzi in the bath tub that provides a soothing end to a day's walk. Unfortunately theres no elevator to the lobby but a short flight of steps but the receptionist was friendly and even gave us a map and showed us the way around with some recommendations. A porter will bring your bags to the rooms. 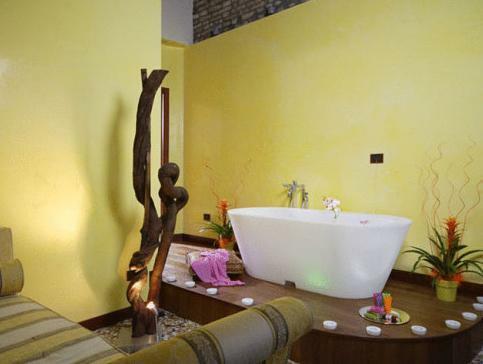 A very pleasant stay especially for couples. The bed and all were nice and comfy but the breakfast is decent not great. Great Wi-fi but limited to number of devices you have. In my opinion, certainly much much better than their fellow hotel namesake. All in all, I would certainly recommend anyone this place. Staff services are very good. They are very helpful and nice. They could speak English. The kind of breakfast are much enough for us. There is boil water machine in the room. There were 2 Abbazine hotels but belong to the same group. Just 3 minutes walk from water bus. In order to enjoy the view quietly I woke up at 6am and took the water bus taking pictures. Walked around and returned to the hotel at 10:30 for breakfast. Served the best coffee! I took a lemon soda from the fridge but the manager did not charge me for that. Good for budget honeymoon. Recommendation for 1 day trip: 1. Take an early train from Milan. You can leave big luggage at the Milan Central Station. Charge is reasonable. 2. Drop the luggage at the hotel 3. Walk around the area 4. Check in when room available 5. Take a walk to St Marco 6. Wine and Dine and return to the hotel 7. Wake up early the next morning to take the water bus 8. Do some shopping before check out 9. Drop the luggage and do more shopping or sightseeing 10. Take a late train and return to Milan. Nice stay,friendly english speaking staff.great hotel in all,the only downside was the noise as the room overlooked the street next to the grand canal which is quite busy until late. We had a great stay in this hotel. Very nice and helpful staffs. Nice breakfast, a very good view from the hotel room. Easily access to the train station and local attractions. Will definitely stay again for our return trip. the hotel is situation right next to Venizia Santa Lucia Rail station, just a left turn from the entrance of station, very convenient location for visitors with luggages. The checkin counter is location in another building further down, at first i was confused where to find it, eventually did. the hotel is room is large, bathroom is large and bed is comfortable, however,the only drawback is that it has no lifts, so tourist with heavy luggage beware, i suggest low floor rooms, but do note that hotel staff will carry your luggage up to your room for you, a nice gesture from the management. we only stayed a night at venice, but it was a pleasant experience. walking along the canals, took about 30mins to walk to the famous Rialto bridge and another 15mins to st mark square, shopping streets for souvenirs and gifts along the way.